The majority of refugees and internally displaced persons (IDPs) find themselves displaced for more than five years—either in their own or in neighbouring countries. 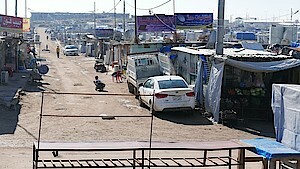 Of the three durable solutions for these so-called protracted refugee situations—local integration, resettlement in third countries and repatriation—the latter is still considered to be the best option by most stakeholders. Yet, due to the increasing prevalence of protracted conflicts worldwide, voluntary return often is not possible. 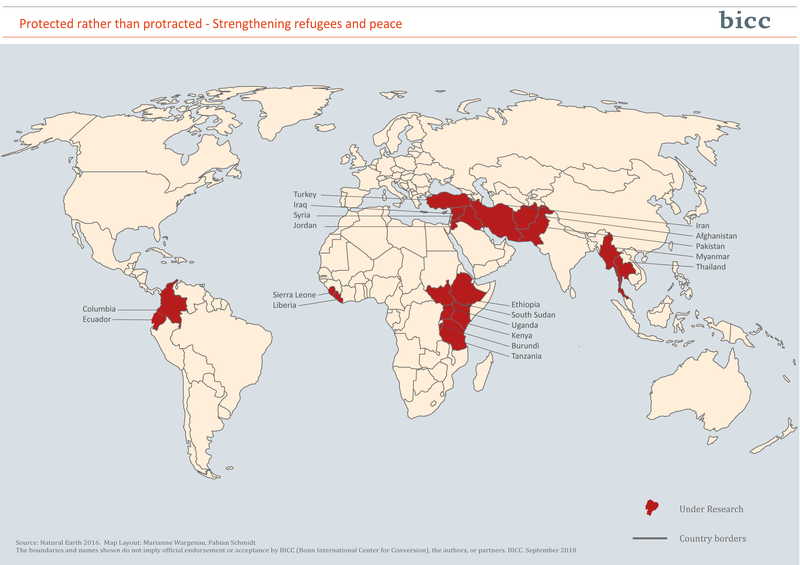 Thus, as only very small numbers of displaced persons are eligible for resettlement, the most relevant issue for the vast majority of displaced persons is local integration. Even though return and local integration of displaced persons have increasingly featured on the agendas of researchers and politicians in the past few years, effective sustainable solutions for practical implementation are lacking. In January 2015, BICC started the four-year research project entitled “Protected rather than protracted—Strengthening refugees and peace” as a response to the challenges posed by reintegration respectively local integration of displaced persons and their participation in peace processes. This project is funded by the German Federal Ministry for Economic Cooperation and Development (BMZ) in the framework of its Special Initiative “Fighting the causes of refugee movements, reintegrating refugees”. In the centre of the project is the collection of empirical data from seven regions, their comparative analysis and the elaboration of concrete proposals for action. · What chances and risks can be observed during the reintegration of refugees and IDPs or rather what makes reintegration sustainable and successful? · Under which conditions does the participation of refugees and IDPs in peace processes play a key role in the sustainability of their return and peace? · How can local integration contribute to the development of host communities and support displaced persons in their current situation? 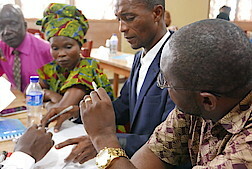 The dialogue-oriented research will be conducted with refugees, IDPs, decision-makers, experts and representatives of national and international organisations in the following seven regions: Middle East; Eastern Africa; Afghanistan/Iran/Pakistan; Southeast Asia; the Great Lakes region; Upper Guinea Coast; Colombia/Ecuador. Information is collected on-site, in and outside of refugee and IDP settlements, and discussed during workshops with all parties. BICC will draw lessons from the observed practice to develop recommendations for action intended to strengthen displaced persons and peace in the long term. Bohnet, H. (2017, June). Going Beyond Temporary Measures (BICC Policy Brief series No. 4/2017). Bonn: BICC. Bohnet, H. (2016, October). Back to turmoil: Refugee and IDP return to and within South Sudan (BICC Working Paper series No. 7/2016). Bonn: BICC. Bohnet, H. (2016, May). Return To Violent Conflict? Challenges of Sustainable Return of Refugees and Internally Displaced Persons to and within South Sudan (BICC Policy Brief series No. 2/2016). Bonn: BICC. 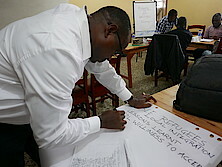 September 2018: BICC/Miparec Workshop: "(Re-)integrating refugees and IDPs: Lessons from Burundi", 27 September 2018, Bujumbura, Burundi. April 2018: KAICT/BICC Workshop: "Best and worst practices in (re-)integrating the displaced: Lessons from Liberia", 19 April 2018, Monrovia, Liberia. February 2018: Brown Bag Lecture with Tabea Scharrer "Leaving the camp behind? The case of Somalian refugees in Kenya", 14 February 2018, BICC, Bonn. January 2018: BICC/CSFM Workshop: "CRRF in Tanzania - expectations, challanges, and lessons learnt", 31 January 2018, Dar es Salaam, Tanzania. November 2017: Bohnet, Heidrun: Protracted refugee situations and durable solutions, Presentation at the cross-area conference “Transregional Migration, Mobility and Forced Displacement: Moving Beyond Methodological Nationalism”, CrossArea e.V., Arnold Bergstraesser Institute, 9 November 2017, Freiburg. July 2017: Brown Bag Lecture with Kees Kingma "Current challenges for post-war demobilization and reintegration in East and Central Africa", 6 July 2017, BICC, Bonn. May 2017: Bohnet, Heidrun, “(Re)Integration”, at Network International Cooperation in Conflicts and Disasters, Workshop on “Coping with Forced Migration”, 16 May 2017, Berlin. March 2017: Brown Bag Lecture with Dr. Mathijs van Leuween & Dr. Lotje de Vries "Claiming Land, Reclaiming Identity – Land Tenure Insecurity and Reform in Situations of Protracted Displacement", 30 March 2017, Bonn. March 2017: Brown Bag Lecture with Dr. Carolin Jacobs "Everyday Justice for Internally Displaced Persons: Not Just a Humanitarian Problem", 14 March 2017, Bonn. March 2017: Brown Bag Lecture with Prof. Dr. Mirjam de Bruijn "Marginality, Mobility, Communication: Case Studies from the Sahel Region", 1 March 2017, Bonn. March 2017: Bohnet, Heidrun: Panel discussion „Target-Group Specific Dimensions of Reintegration“, expert forum on “Return and Reintegration in the Migration Context”, 1 March 2017, Eschborn. February 2017: "Der Friedens- und Demokratisierungsprozess in Myanmar: Hoffnungen und Enttäuschungen für die Lösung jahrzehntelanger Vertreibung", panel discussion by Markus Rudolf and Clara Schmitz-Pranghe in cooperation with Burmainitiative der Stiftung Asienhaus, 9 February 2017, BICC, Bonn. February 2017: Dr. Michael Rohschürmann: "Regionale Konflikte und politischer Islam", 7 February 2017, BICC, Bonn. Winter semester 2017/2018: "Rückkehr und (Re-)Integration von Geflüchteten", Seminar at the University of Bonn by Heidrun Bohnet and Elke Grawert. December 2016: Brown Bag Lecture with Dr. Florian Krampe "Towards Sustainable Peace: Understanding the linkages between social, political, and ecological processes in post-war countries", 21 December 2016, Bonn. December 2016: „Universal norms for unique situations? Ethical challenges of working in contexts of violent conflict and displacement from a social-anthropological perspective“, Guest lecture, University of Freiburg, 15 December 2016, Freiburg. December 2016: Brown Bag Lecture with Dr. Cüneyt Gürer "Conflict and Crisis in Syria: Refugees, Camps and Security in Turkey", 13 December 2016, Bonn. November 2016: Brown Bag Lecture with Dr. Alexander Horstmann "Helping the Wounded as Religious Experience: The Free Burma Rangers in Karen state, Myanmar", 16 November 2016, Bonn. November 2016: BICC Annual Conference “Fleeing Conflict – Trajectories of Displaced Persons”, 3 November 2016, Bonn. June 2016: Heidrun Bohnet at the Bonner Politik-Forum: "Freiwillige Rückkehr von Flüchtlingen. Chancen und Risiken für Frieden und nachhaltige Entwicklung", 23 June 2016, Bonn. May 2016: Markus Rudolf lecture series Flight, Migration, Integration: "Flucht, Migration und lokale Integration im Globalen Süden", 31 May 2016, University of Bonn.